Looking for lean? 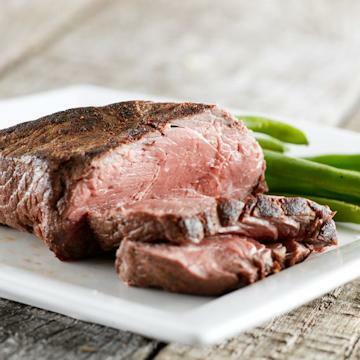 Top Sirloin Steaks are perfect for you! Each steak has a bold, beefy flavor and is naturally lean! Add our Natural Seasoning and treat your family to a meal complete with Roasted Garlic Mashed Potatoes, and Green Beans. Meal serves 2. Steak requires cooking. This steak has no exterior fat so be careful not to overcook. It is excellent for calorie counters who want a light luncheon entree. Please refer to the Steak Cooking Chart to prepare. This steak would also slice well for stir-fry, or would be excellent in your favorite stew. Beef, Pork, Lamb, Veal and Poultry have been born, raised and harvested in the USA.